Bradley Manning Not Guilty Of 'Aiding The Enemy' : The Two-Way The charge was the most serious against the Army private, who admitted releasing hundreds of thousands of classified documents. Manning, however, was found guilty of other serious offenses including multiple charges of espionage. This post was last updated at 6:42 p.m. ET. 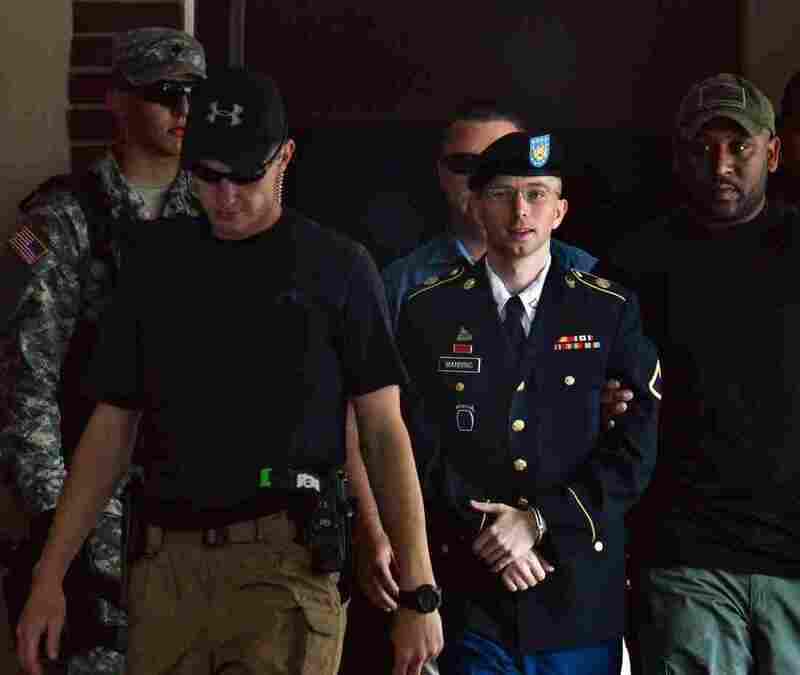 Army Private Bradley Manning, center, leaves the courtroom at Fort Meade, Maryland, on Tuesday. Bradley Manning, the former intelligence analyst who perpetrated the largest leak of classified information in U.S. history, has been acquitted of the most serious charge against him. Col. Denise Lind, the military judge presiding over the case in Fort Meade, Md., found the Army private not guilty of aiding the enemy, when he released hundreds of thousands of classified documents to WikiLeaks. The charge carried a possible punishment of life in prison. Manning, however, was found guilty of other serious offenses including multiple charges of espionage and five charges of theft. Kevin Gosztola, who has been covering the trial from the beginning for the liberal site Firedoglake, reports that if you add up the potential punishment for all the charges, Manning could be in jail for "over 100 years." The sentencing phase of the trial is scheduled to begin tomorrow morning. Philip Cave, an expert on military law, says this case will likely go on for years. The case is automatically appealed to the convening authority, then it can go to the U.S. Army Court of Criminal Appeals, and then to the civilian U.S. Court of Appeals for the Armed Forces and then possibly all the way to the Supreme Court of the United States. Cave also says that Col. Lind can impose whatever sentence she deems necessary. "She can impose a punishment of no punishment all the way to maximum confinement," Cave told us. WikiLeaks, the recipient of the leaked information, tweeted that today's verdict is "dangerous national security extremism from the Obama administration." The verdict, it continued, sets a "very serious new precedent for supplying information [to] the press." "Private Manning is in a world of trouble. ... but he certainly had a good day today." That's how Eugene Fidell, a lecturer at Yale Law School and an expert on military law, summed up the Manning case for NPR's Carrie Johnson. What he means is that while Manning is likely facing dozens of years in prison, he beat the government on its biggest charge. "From a distance [what you see is], the federal government trying its best to prosecute a very serious charge, possibly an aggressive charge, but still a very serious charge against a very low ranking enlisted man and the enlisted man prevailed," Fidell said. "And that I think speaks volumes about the strong points of the military justice system." "While we're relieved that Mr. Manning was acquitted of the most dangerous charge, the ACLU has long held the view that leaks to the press in the public interest should not be prosecuted under the Espionage Act," said Ben Wizner, director of the ACLU's Speech, Privacy and Technology Project. "Since he already pleaded guilty to charges of leaking information – which carry significant punishment – it seems clear that the government was seeking to intimidate anyone who might consider revealing valuable information in the future." NPR's Carrie Johnson points out that Manning was acquitted of one espionage charge that related to a 2009 video shot in Afghanistan. Alexa O'Brien points out in her round-up of charges that the video, which showed a bombing in the Farah Province of Afghanistan, was unclassified. By Carrie's math, Manning was found guilty of 19 of the 21 charges he was facing. Earlier, relying on the AP and others, we reported that Manning was found guilty of five espionage charges; the AP now reports that number is six. As The New York Times reads the verdict, beyond Manning, this trial could have implications for future leakers. The "aiding the enemy" charge was unprecedented in a leak case, the Times explains, and it could have "significant long-term ramifications for investigative journalism in the Internet era." The Times continues: "The government's theory was that providing defense-related information to an entity that published it for the world to see constituted aiding the enemy because the world includes adversaries, like members of Al Qaeda, who could read the documents online." With her acquittal, Col. Lind obviously rejected that thinking. At about 1 p.m. ET., we're expecting to hear the verdict in the military trial of Pfc. Bradley Manning. The 25-year-old has already been escorted into the courtroom in Fort Meade, Md., and supporters have gathered outside to demand his freedom. There are quite a few reporters and others inside the courtroom tweeting updates. Among them: Adam Klasfeld, of Courthouse News Service; Charlie Savage, of The New York Times, Kevin Gosztola, of Firedoglake; independent journalist Alexa O'Brien and activist Nathan Fuller of the Bradley Manning Support Network. We'll update this post with the latest news as we get it. According the AP and several reporters inside the court room, Bradley Manning has been acquitted of the most serious charge against him. "Video feed is on. Court starting soon. #FreeBrad #Manning"
Even if Manning is cleared of aiding the enemy, the most serious of the charges against him, he could still face some serious jail time. Courthouse News Service reports that just adding up the potential punishment for the 10 counts Manning has admitted to, he could be looking at up to 20 years in prison. According to reports from inside the media operation center, we may have to wait until the judge is completely done reading her verdict before we get word of it. "New PAO Officer says that people cannot leave media operations center to file outside, while Court is in session. #Manning"
The Internet is spotty, so that also may play a role. And the verdict could be complicated, so it might take a little while to sort through it. We'll let you know, once it is in, and we'll post again once we're sure we understand it. Documents in the Manning case, by the way, are being posted by the military here. -- Manning is facing 21 counts — including espionage and theft — in connection to biggest leak of classified information in the history of the United States. -- The former intelligence analyst has already pleaded guilty to 10 of those counts. He has admitted to releasing more than 700,000 documents, including battlefield reports and U.S. embassy cables. "The government argued that when Manning released information to WikiLeaks — instead of traditional news outlets — it was because he wanted the data to be available in an indiscriminate manner. The defense argued that Manning was a naive whistle-blower who wanted the information he leaked to spark a national discussion about war and diplomacy." -- Manning opted to have a judge, instead of a jury decide his case. Col. Denise Lind said she will hand down her verdict at 1 p.m. ET. -- If you want real-time reports from the court, there are a few people who have been covering the trail: Adam Klasfeld, of Courthouse News Service; Charlie Savage, of The New York Times, Kevin Gosztola, of Firedoglake and independent journalist Alexa O'Brien.